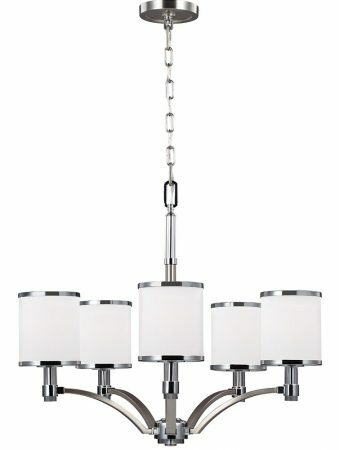 This Feiss Prospect Park 5 light chandelier in satin nickel finish with chrome detail and opal glass shades is dramatic, glamorous and features crystal detail. Boasting a circular ceiling mount, chain suspension and central rod, with five curved arms fanning out from the lower gallery. 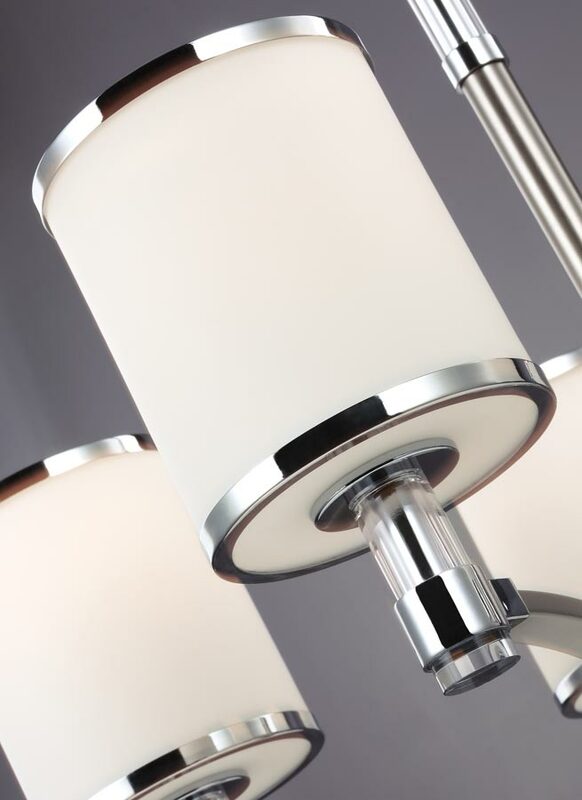 Each arm features an upward facing opal etched cylinder shade decorated with metal trim. The main frame and ceiling mount are finished in satin nickel, with polished chrome detail here and there. The Prospect Park lighting collection takes a traditional profile and modernises it with updated design elements to create a period uptown vibe. It features a rich, two-tone finish of satin nickel with polished chrome accents to highlight the details of the silhouette. Each cylindrical opal etched glass shade boasts metal bands at the top and bottom to add a bit of formality and unexpected pressed crystal on each stem elevates the tailored look with a bit of glamour. The two-tone finish, opal white etched glass and attention to detail gives this chandelier a three-dimensional look that exudes quality and instantly draw the eye. The geometric shape and highly polished chrome accents add a bright airy feel that is sure to complement a variety of Art Deco, modern or contemporary interior design styles. Perfect for installation over a dining table, in a hallway, landing, living room or bedroom. A contemporary chandelier supplied with 152cm of chain link suspension that can be shortened at the time of installation to achieve the desired drop; please see below for exact dimensions. There are matching fittings in the Prospect Park lighting range that includes a nine-light chandelier, three and four-light pendants, a two-light dual mount ceiling light and a wall light; please see below for the complete collection. This contemporary light is supplied by Elstead Lighting and designed in the USA by Feiss, founded in New York in 1955. 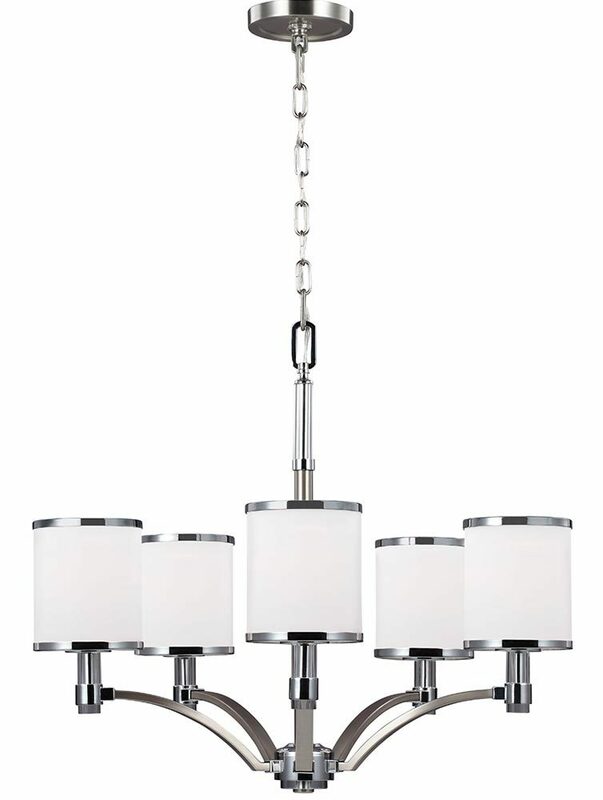 They have become well known over the years for their contemporary yet classic styling, quality and great original designs like the Prospect Park 5 light chandelier in satin nickel finish with chrome detail and opal glass shades you see here.